AutoMate AM-250 is the industry standard for Induction Sealing. This is the original Waterless Cap Sealer. The Model AM-250 is the right choice for small to high volume production. The ultra-compact machine delivers 2,500 Watts of power at the sealing head! Cap sizes up to 70mm diameter (sealing heads available for up to 120mm and specialty caps). Patented design energy efficient foil sealing systems come complete and ready to use pre-assembled. Protected by over 15 patents. Screens in English, Spanish and French. Load sensitive operator assist “LED BAR GRAPH”, for easy set-up and operating status (PATENTED). Built in power save mode minimizes energy consumption. Efficient advanced circuitry for increased power and minimizes waste heat production (Not air cooled like others on market). Portable one piece welded frame with locking swivel castors and stainless steel leveling screws with floor pads. Fast easy changeovers, height adjustment-accommodates 1” tall to 14" tall containers with a simple hand adjustment. Standard digital bottle counter and rate meter (bottles per minute). Mini-computer keeps track of basic statistics which include: A) Total bottles sealed B) Sealing power used C) Batch and lot Numbers D) Date E) Faults encountered F) Time G) Multi-Language Screens H) Conveyor speed I) User friendly menus and recipe storage J) And more. Interlocking stainless steel safety guard switches. Easy to read two line digital full text display. All operator settings including LED indicator lights at your fingertips. Minimizes operator training. State of the art plug in electronic manifold for sensors to hook up with no wiring required. 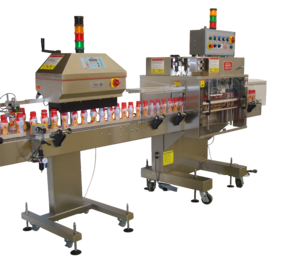 Reject System: Pushes faulty bottles off conveyor (Such as missing foil/cap, crooked cap). Includes: Pneumatically operated angled paddle to gently guide bottles off conveyor, stainless steel mounting, regulator, valve, gauge, integral program on sealer control panel. Suitable for bottle sizes of up to one gallon. Remote start/stop water tight controls with 12’ supply cord. Longer lengths available.